Size: This Brockham log cabin with internal shed annexe is 3.0m x 3.9m (10ft x 13ft nominal). Apex, gable or ‘A’ Shaped roofed Log Cabin Style. Note this is the external size of the body of the cabin. The lugs extend 100mm on each corner making the overall size (as most other companies quote) 200m larger. We mention this so you know you are comparing ‘eggs with eggs’. Approximate clear internal size will be approx 2.9m x 3.8m. Please check with us if internal size is crucial. The shed section is 291cm x 117cm and has a single solid door to access it. This door can be fitted to suit you..
Cladding: The standard log profile has designed wind-tight connections to ensure a superior resistance against wind and are 44mm thick and slot into each other. Untreated. Kiln dried timber from sustainable sources. 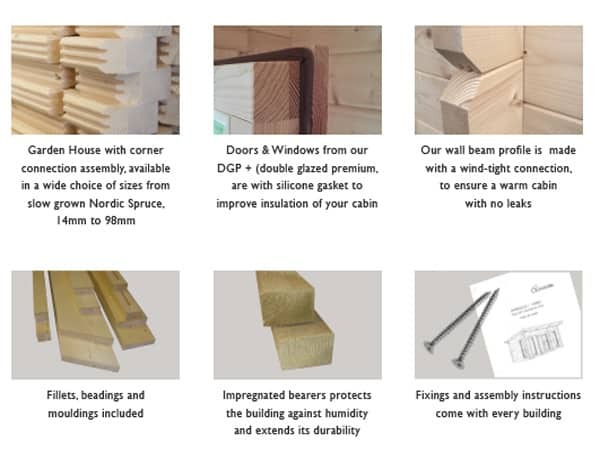 The highest grade of Spruce is specified which is only sourced from the coldest parts of the Northern Nordic region to ensure the maximum stability and longevity of the timber. Naturally, this costs significantly more but we will not cut costs in this area and risk the quality of your building in search of a quick profit. 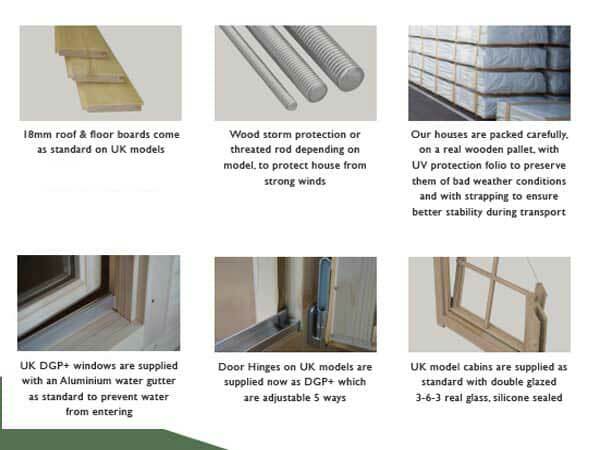 Doors: Joinery quality double glazed single door 835mm wide x 1850mm high (32¾in x 72½in) into main part of garden cabin. Easy adjust hinges complete with gasket seals, fitted silver finish door handles, cylinder lock and two unique keys. Low doors sills giving you easier access into your log cabin. Supplied untreated. Beware of doors with single glazing or excessively high door sills. Partition: Internal partition included as standard giving you two distinct areas within this log cabin with rear storage. Untreated. Kiln dried timber from sustainable sources. The annexe section is 291cm x 117cm and has a single solid door to access it. Door fitted to suit you. 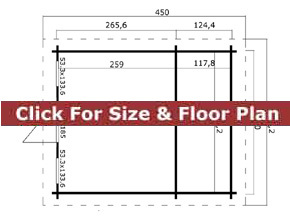 Rear Door: Joinery quality single door 835mm wide x 1850mm high (32¾in x 72½in) – approx sizes for access into shed section. Easy adjust hinges complete with gasket seals, recessed door latches, highly secure Euro Cylinder barrel Type mortice lock, fitted gold finish door handles and three unique keys. Supplied untreated. This enables easy access into storage section. Floors: 18mm thick T&G untreated boards used on these floors. No chipboard, OSB or other cheap sheet materials used on the floor, unlike some other cabin UK suppliers. The sturdy floor joists are normally spaced no more than 650mm apart. All floor joists are pressure treated for long life as standard. Windows: Two (2) Georgian style joinery quality inward opening window included as standard. 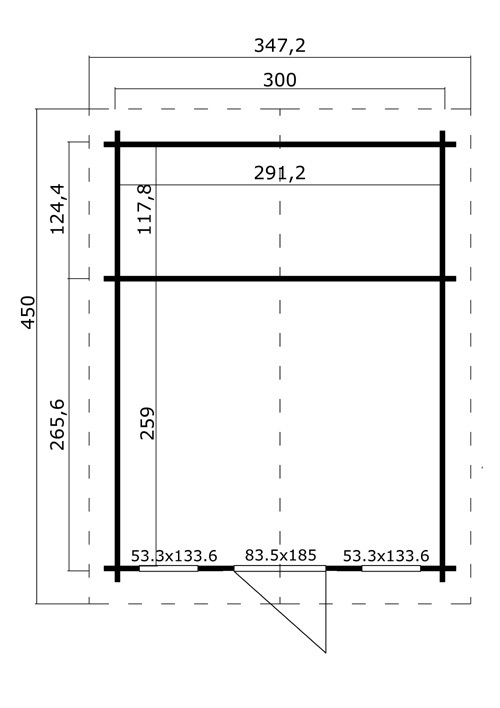 Size of windows are 53cm wide x 133cm high (20¾in x 52in). Complete with easy adjust hinges, silicon gasket seals and delightful silver finish window handles. Supplied untreated as standard. Double glazed as standard NOT single glazed. Lower Walls: Height: 205cm (79in) – on all Brockham cabins. Ridge Height: Height. 251cm – on all Brockham log cabins. Assembly: Log cabins are supplied in kit form for self assembly. Option for assembly through a third party if required. If being built you would require a concrete base or solid and level paving slab base. Optionally, we have an option for building a base for you. These log cabins are assembled by interlocking the panels for ease of taking it down again if you decide to move. The superb design of the Trentan ‘Brockham’ log cabin shed combination building adds a new look to the ‘norm’ with its clever and useful shed section which blends in perfectly with the log cabin making it a superb building for your garden. The single solid door to the store can be located to suit your needs and the half glazed door to the log cabin section is on the front. It’s always a good idea when buying a log cabin to take a look beforehand. We have two display areas close to Woking, Farnham and Guildford where you can take a closer look and make sure this is the right log cabin for you. Besides that these buildings are less than 2.5m high so are planning friendly.